Philadelphia Flyers captain Claude Giroux skates off the ice after a Carolina Hurricanes' goal. Something seemed a little off. On Thursday night against the Carolina Hurricanes, the omens came quickly for Dave Hakstol's team. The Flyers, outshot 8-1 over the first five minutes of play, certainly didn’t start the game like a team that was 9-0-1 over its last 10 games. The early indications came to fruition with 5:37 left to play on Sebastian Aho’s game-clinching goal, sending down the Flyers, 4-1, to Carolina and snapping the their six-game winning streak. As the Wells Fargo Center began to empty, amid a few feeble E-A-G-L-E-S chants, all of the goodwill this team had built was greeted with a spattering of boos. The night featured a listless Flyers team that didn’t show up – and a disinterested crowd that matched the level of play they saw from the home team. As the Flyers head into an important weekend of back-to-back games against the NHL-leading Tampa Bay Lightning on Saturday and Florida on Sunday, they'll need to be careful not to make a habit out of these types of performances. 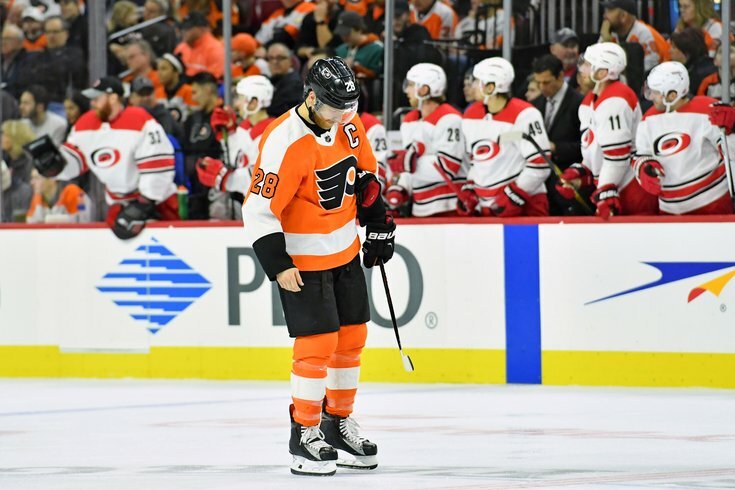 Otherwise, after climbing all the way to the top of the Metropolitan Division – they're currently a point behind the Capitals for the division lead – the Flyers could begin tumbling back down the standings. For as close as they are to Washington, they're also just four points from dropping back into a wild card spot. Maybe this was inevitable for the Flyers, who barely snuck out of Montreal with a shoot-out victory on Monday. “I think the last few games maybe some bad habits creeping into our game, and we got exposed in some of them tonight,” defenseman Andrew MacDonald said. “I think in the third there, we got an early goal and gave ourselves a chance, but they were the better team the whole night. Hakstol openly admitted his team just didn't have the energy it needed to compete. When asked if it was anything Carolina did, bottling up the Flyers in the neutral zone, Hakstol dismissed the thought. “I don’t think it was a neutral zone, we didn’t have the puck very much in the offensive zone for a couple of reasons,” Hakstol said. “They had the puck more than we did. We didn’t check it back well enough. We were on the outside a lot. “I don’t think we were direct enough. At times, we were looking for one more play than a direct, hard play to the net. You’re going to have nights where you don’t have your best level of energy. That, for sure, was tonight for us. We started both the first and second periods slow, and we could never establish anything. We had some spurts but we never really able to simplify our game enough and really put in a good push. Down 3-1 in the third, the Flyers had a chance to close within a goal, when Carolina’s Noah Hanifan was called for a holding penalty with 7:58 left to play. But the Flyers squandered the chance, generating few scoring chances. Over two minutes later, Aho sealed it for the Hurricanes, who were coming off a 4-3 overtime loss to Boston after blowing a 3-1 lead. The key is not letting his players dwell on such a poor performance, especially given the task ahead of them. “You don’t ever accept them, number one," Hakstol added. "You have to, especially this time of year, move on from them quick and make sure that the effort next time out pushes us back in the right direction. “A full realization, we go on the road to a [Tampa Bay] building on Saturday afternoon that will be a heck of a test for our team — one that we should be up for. You always have to take something and make a positive out of it, especially this time of year.